Employee engagement is a top concern for CEOs and HR leaders around the world. Surprisingly, the 2017 Mercer Talent Trends study reports that executives are not getting the type of engagement information they find valuable. In order to build a thriving workforce, organizations – regardless of size - need to measure employee engagement levels in order to understand what’s working – and what’s not. Mercer | Sirota Engagement Snapshot Survey measures employee engagement using a proven, research-driven model. Leveraging over 40 years of experience in employee research, this survey instrument is delivered online and uses a set of predefined dimensions and items to get at the validated drivers of engagement. All items are linked to Mercer | Sirota’s best in class global normative database, making for easy comparisons to benchmarks. And with results in as little as one month, organizations can move quickly from planning to action. At a financial services company: Modest increases in employee attitudes were linked to $500 million in asset growth and $28 million in revenue due to increased customer satisfaction. At a government contractor: Engineers’ overall satisfaction ratings explained 22% of the differences in site turnover rates. In retail: Stores in the top tier of employee customer focus scores increased sales by 10% more than stores in the bottom tier. Planning, administration and reporting completed in as little as one month. Preselected set of 49 closed questions and 2 open-comment questions based on the Mercer | Sirota Dynamic Alignment Model. Validated measures of engagement, alignment, enablement and innovation. Surveys available in 18+ languages. Real-time results and response-rate tracking. Engagement benchmarking via Mercer | Sirota’s robust normative database. 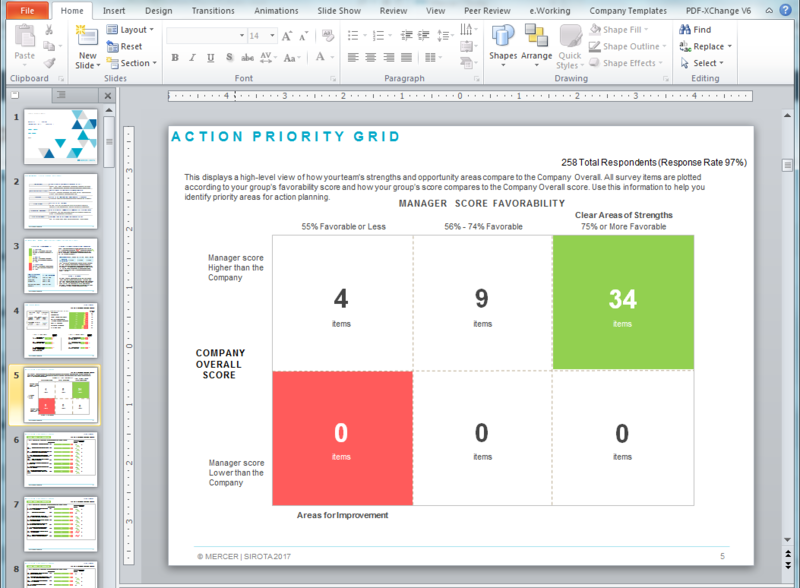 Dynamic, real-time interactive results dashboards with export capabilities. One-hour consultant-led executive presentation of survey results and key action priorities. Online and mobile survey delivery. 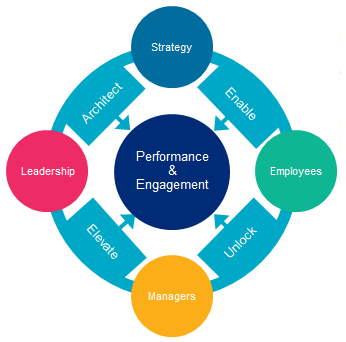 Employee performance (productivity and results) is the combination of individual talent (capability, likability, drive) and engagement (pride, motivation, commitment), meaning the best way to maximize talent is to ensure it is engaged talent. 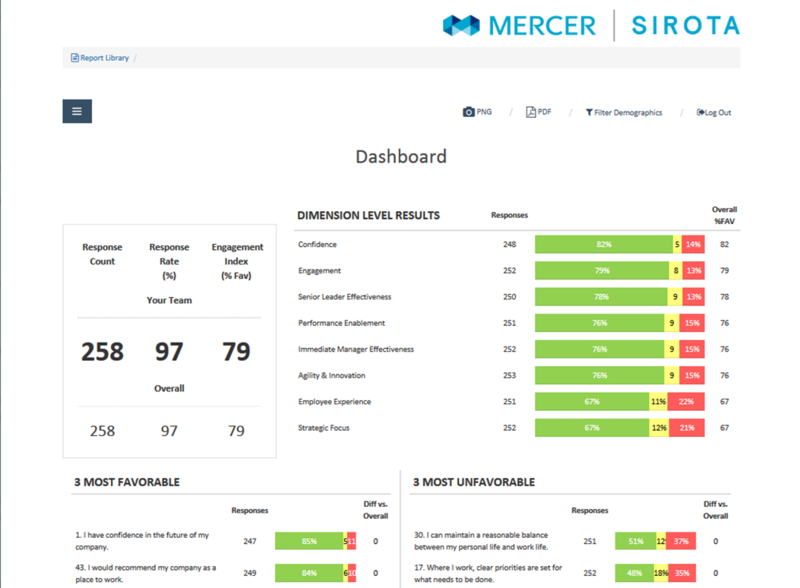 By measuring engagement, Mercer | Sirota Engagement Snapshot Survey helps clients to identify the opportunities to improve the performance potential from their talent. Serving as the framework for engagement survey question development, the Mercer | Sirota Dynamic Alignment Model fosters high performance by aligning strategy, leadership, employees, and managers. 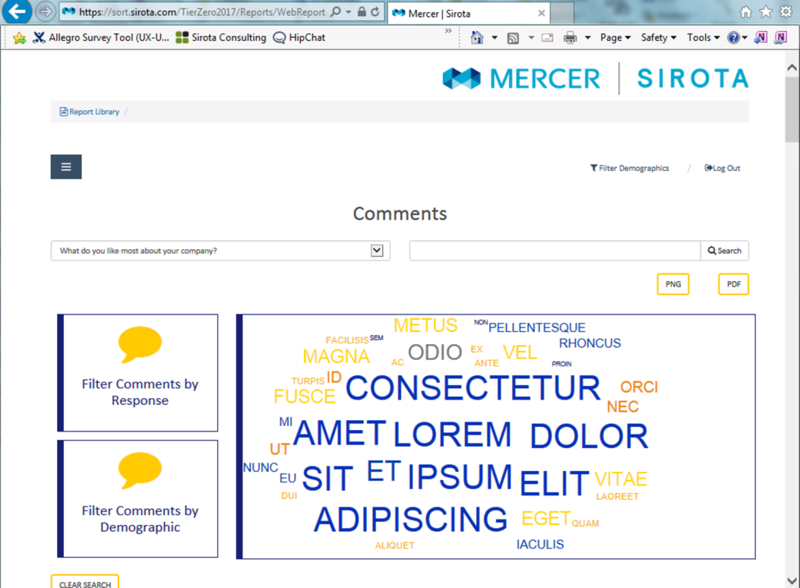 Mercer | Sirota Engagement Snapshot Survey delivers actionable reports to you, your managers and your leadership in online, interactive formats as well as in PowerPoint and Excel. Click on the screenshots to view in a larger size. Short DescriptionEmployee engagement surveys for small and midsize organizations.